Arsenal legend-turned-pundit Martin Keown believes the Gunners’ hierarchy should bow to the wage demands of Wales international Aaron Ramsey. The midfielder has been in a contract standoff with the Gunners since the turn of the year and reports have recently claimed that talks have negotiations have broken up altogether. Amidst this, Ramsey has not let his performances dip in the club’s colours and he came up with a stellar performance off the bench versus Fulham which included an assist and a goal which he orchestrated from his own backline. 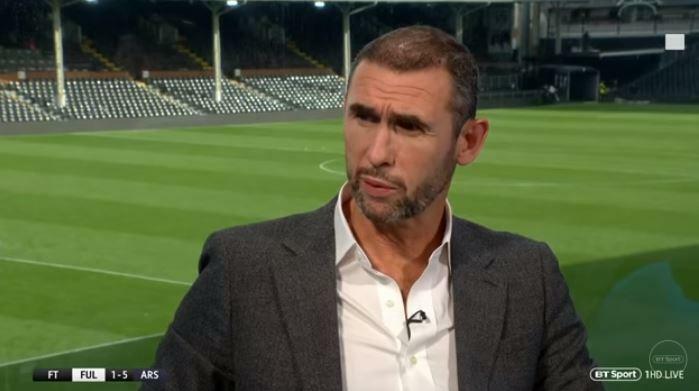 Speaking after that triumph, Keown urged his former side to come to terms with Ramsey regarding a new contract with his existing one expiring in under nine months’ time. On March 17 of the current year, As.Monaco knocked Arsenal out of the Champions League thanks to away goals and Arsene Wenger later went on expressing his dissatisfaction towards that rule as the French manager believes stated that it should be eliminated from the Champions League and the Europa League. Arsene Wenger has once again voiced his opinion concerning something in the world of football and this time it’s involving referees. A few weeks ago, Zlatan Ibrahimovic received a red card after he tackled Chelsea’s Oscar during a Champions League match but after seeing replays of the tackle, the red card did appear to be way too harsh as the Swedish player did not deserve to be removed from the match due to the tackle. Arsenal will be looking to return to winning ways when they host title favourites Manchester City in Saturday’s late kick off in the Premier League. The Gunners’ took just one point from six available over the past seven days, following up last Saturday’s 6-0 humiliation at Stamford Bridge with a 2-2 draw with Swansea City three days later. Arsenal will be looking to bounce back from Saturday’s humiliation at Stamford Bridge when they take on Swansea City at the Emirates Stadium this evening. The Gunners will have both Alex Oxlade-Chamberlain and Kieran Gibbs available after the red card shown to Gibbs for the incident involving them both at Stamford Bridge was rescinded, though Laurent Koscielny is out after he picked up a calf injury at the weekend. Arsenal will look to close the gap on leaders Chelsea to just a point as they travel to Stamford Bridge on Saturday afternoon, in what will be manager Arsene Wenger’s 1000th game in charge of the club. The Gunners go into the game on the back of last weekend’s narrow victory in the North London derby, and another three points here will see them well and truly back in the title race, so much so that they would return to the top of the league if they were to follow up victory at the weekend with a win at home to Swansea City on Tuesday evening. Injured Arsenal midfielder Abou Diaby has said that he has no thoughts of retiring, according to the Daily Star. The France international has been side-lined since picking up a serious knee injury last March, and that was the latest in a long line of serious problems that have blighted his time in North London. Arsene Wenger is set to be hand a £100 transfer kitty by the club’s hierarchy this summer, according to the Telegraph. The Frenchmen, who is expected to wait until the end of the season before signing a new contract as not to disrupt the Gunners’ run in, will be rewarded for his loyalty with funds which will allow him to make signings akin to last summer’s record purchase of Mesut Ozil from Real Madrid. Arsenal will be looking to put their Champions League disappointment behind them when they travel to North London rivals Tottenham Hotspur on Sunday afternoon. Arsene Wenger’s side could be as much as ten points behind leaders Chelsea at the time of kick off, as the Blues travel to Aston Villa on Saturday afternoon while Manchester City will also move ahead of them should they win at Hull City. Arsenal have exited the Champions League after only managing to draw 1-1 with holders Bayern Munich at the Allianz Arena yesterday evening. Bastian Schweinsteiger put the Bundesliga leaders three up on aggregate on fifty-four minutes before Lukas Podolski scored to make honours even on the night. Arsenal will be without Kieran Gibbs for this evening’s crucial Champions League last sixteen second leg against Bayern Munich. Yaya Sanogo will also miss out, along with Jack Wilshere, Theo Walcott, Abou Diaby and Aaron Ramsey but Laurent Koscielny is back in contention after recovering from a hamstring injury.